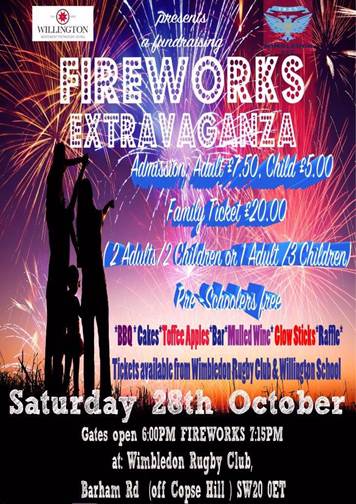 Please don't forget we have a spectacular Fireworks display at the club on Saturday 28th October. Tickets are on sale at the club behind the bar (cash or card payment). Details in the attached poster – please feel free to share this ????. N.B. Tickets will not be on sale on the night, buy them now before we sell out! 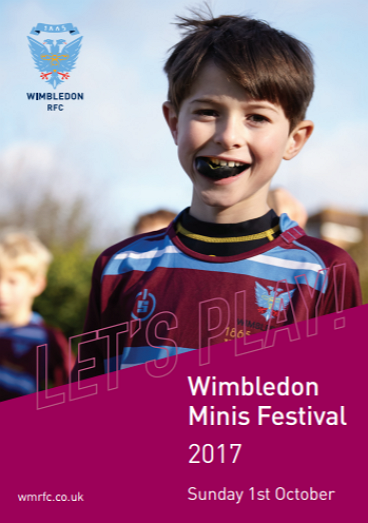 As we settle into the 2017-18 rugby season we can all be proud of having run another massively successful Wimbledon Minis Rugby Festival last weekend. Huge thanks to the Under 11s for organising it and all the other volunteers that made the day such a success. This weekend a good number of the minis are at the KCS festival and a few of the youth teams are away. 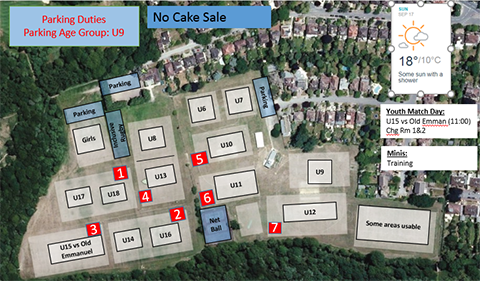 The Under 9s are selling delicious cakes, the Under 7s are on parking. A massive batch of Wimbledon RFC rugby kit has arrived at the clubhouse for sale. The event starts at 6pm and has a BBQ, Cakes , raffle, bar (obviously) and stuff that flies around and goes bang! You know the drill. This is a joint fundraising event for the club and for Willington school. A huge welcome to our guests this Sunday: Wimbledon Warriors, KCS, Rosslyn Park, Esher and Battersea Ironsides. Wimbledon RFC is not alone in having challenges with parking! Even if the weather is kind to us, parking will be difficult. 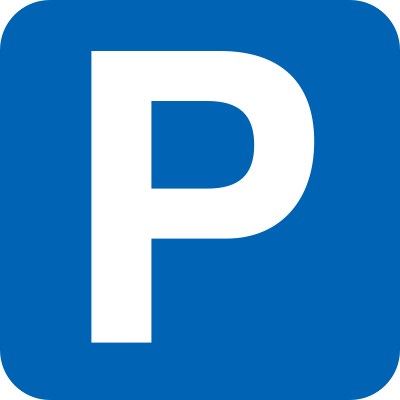 If you arrive later than 9.15 we would STRONGLY ADVISE YOU to park in one of the alternative locations on page 2 of our parking policy. 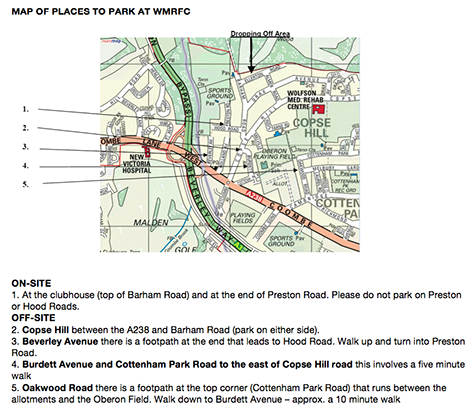 Please listen to instructions you are given - and respect that everyone marshalling the parking are parent volunteers. A big welcome to Richmond FC who have a training session with the U10s. Visitors are asked to enjoy themselves heartily (Shaun will have bacon butties and coffee on the go from 9.15 or so) and to park according to our parking policy. Specifically DO NOT BLOCK ACCESS TO RESIDENTS' PROPERTIES OR CAUSE BOTTLENECKS THAT COULD CAUSE AMBULANCES TO BE DELAYED. Next week it's the Wimbledon Rugby Festival. We look forward to welcoming u7s to u11s from clubs around the area. All youth groups (u12s to u18s) will be training elsewhere so look out for emails from your age group managers. This is the last Sunday that we'll be running the subs desks in the clubhouse (0920 to 1230). So if you've not paid yet - 450 have, about 80 are still to pay - this is the last chance to pay with ultimate ease! 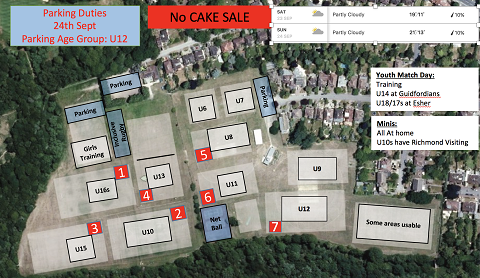 No cake sale this week but Under 12s are doing the parking. After another brilliantly well-attended Sunday we come to week 3. Please note this is your last chance to benefit from the early bird discounts. See our how to join Wimbledon Rugby Club page for full details. Don't forget we have a new online store, our kit suppliers Akuma Rugby have launched a brand new online store to buy your Wimbledon Rugby kit. There are sample sizes at the clubhouse to try on, then order online. Contrary to the plan below, we HAVE a cake sale thanks to the wonderful Under 7s. Under 9s are on parking patrol. We had a brilliant and very busy first Sunday of the new season last week. Lots of new faces, as well as plenty of older ones. 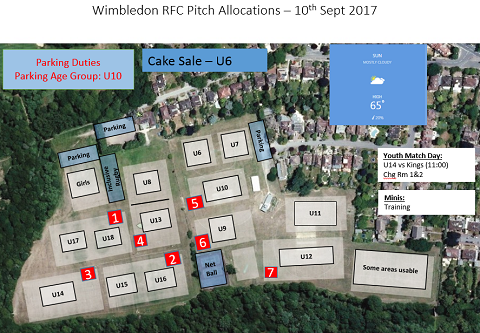 Everyone, regardless of experience, boys and girls, are welcome to come and play rugby at Wimbledon Rugby Club. We are one of the few clubs in the area to never turn people away. Boys and girls play together from reception age to under 11s. Thereafter we have a thriving girls squad for under 13s and under 15s. Boys youth teams go from under 12s to under 18s. 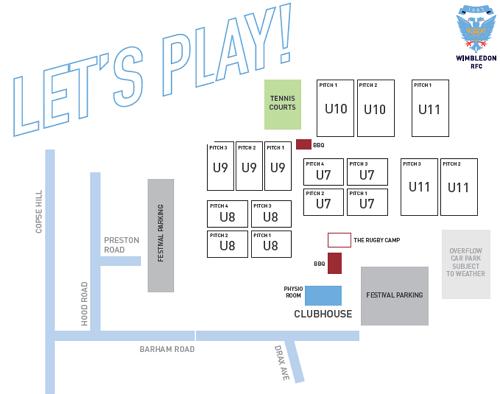 Contact the relevant age group coach/manager by clicking here or just come down ready to play with gum shield and boots. Try us out for free for a couple of Sundays to see how you get on. Training starts every Sunday at 10am sharp. 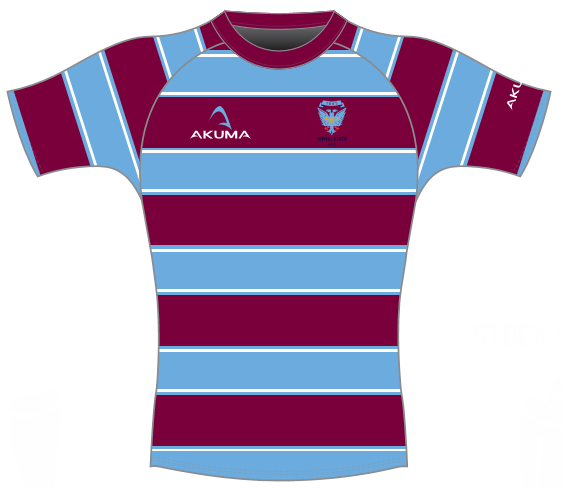 Our kit suppliers Akuma Rugby have launched a brand new online store to buy your Wimbledon Rugby kit. There are sample sizes at the clubhouse to try on, then order online - simples! Please bring any old kit for the second hand sale. All kit sold for donations to the club. We are running a registrations desk again this Sunday and for the next three. Early bird discounts apply until 17 September. See our how to join Wimbledon Rugby Club page for full details. 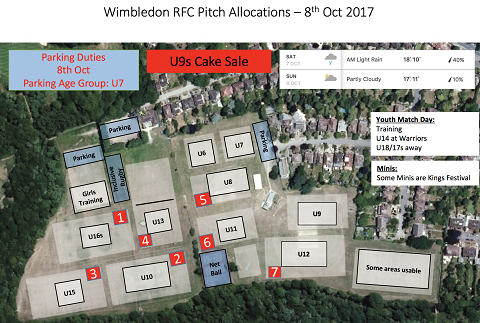 The Under 10s are on car parking duty and the Under 6s are selling cakes. Rugby camp at Wimbledon Rugby Club 24 and 25 August 2017 - ideal pre-season rugby training! 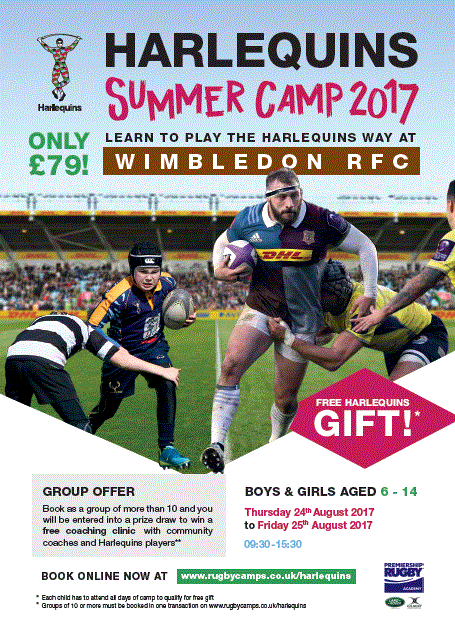 Wimbledon RFC are proud to be an official partner of Harlequins summer holiday rugby camps. 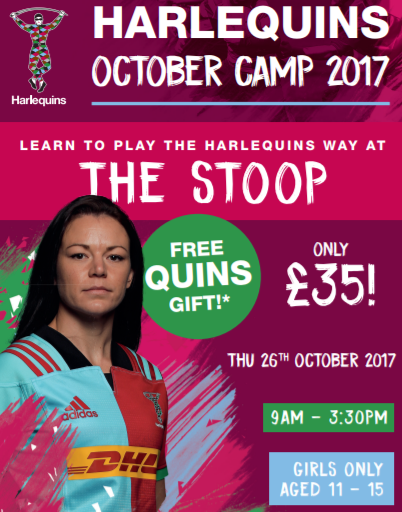 Throughout the summer Harlequins run kids rugby camps throughout the London and west-of-London region. Wimbledon are thrilled to host one of the best of them all, timed for pre-season training, just before our new season starts on 3 September. The camp runs on the Thursday and Friday before the August bank holiday - 24 August and 25 August. Just £79 (plus booking fee) for both days. Ideal for minis (age 6, age 7, age 8, age 9, age 10, age 11) and youth (age 12, age 13, age 14). For boys and girls. 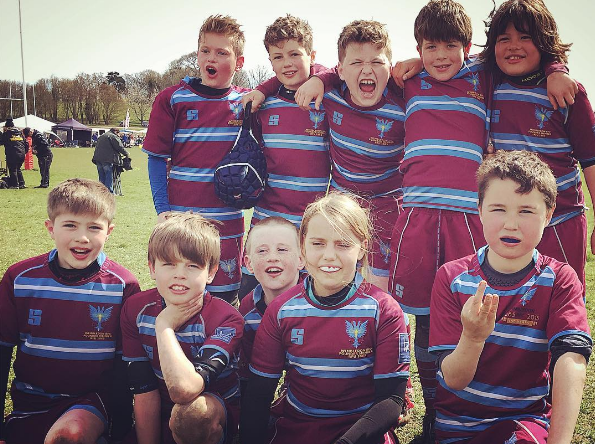 The rugby camps are run by experienced coaches (level 2 and above) with DBS checks and follow Harlequins Rugby principles of TRUE (Tempo, Ruthless in every contest, gameplay is Unpredictable, and, we Enjoy ourselves). As well as receiving expert coaching, all participants on our camp will receive a free Harlequins gift, discount on Big Game 10 tickets, a chance to win Harlequins prizes and an exclusive invitation to a Harlequins training session to meet the players. We know how good the Harlequins style of play is as Wimbledon RFC's 1st XV have been coached by Harlequins players Nick Easter, Nick Evans and Joe Gray over the past three years and have been promoted to their highest league ever thanks to their influence. Wimbledon RFC is the embodiment of the Harlequins Way! Each day is action-packed, player-centric and increasingly popular every year. Book early to avoid disappointment. In 2016, Wimbledon RFC opened its new changing room facility. We now have 4 new changing rooms with en suite showers, two referee changing rooms, a physio room, two changing rooms with shared showers and meeting room space. The two changing rooms with shared showers are our old changing rooms, rather dreary and in need of some TLC! On Sunday 25 June and Sunday 2 July 2017, we will be rallying our community to help upgrade them and to complete a general tidy up of our changing room, clubhouse and non-playing outdoor areas in time for the 2017/2018 season. 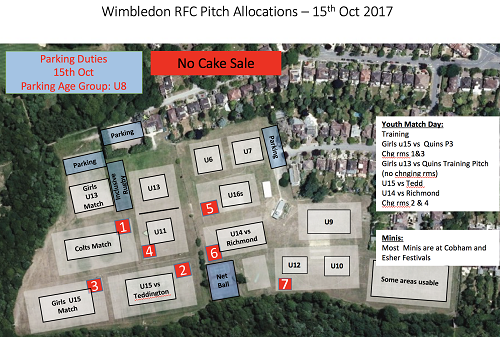 Please join us in our fundraising attempts to make this a reality and email secretary@wimbledonrfc.co.uk if you would like to offer your volunteering time. We are raising funds to help with this project and using crowdfunder to facilitate this. 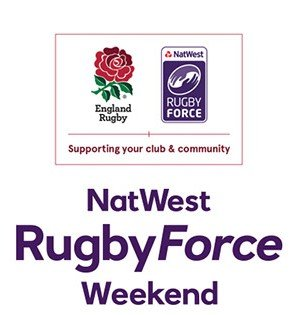 Visit: www.crowdfunder.co.uk/wimbledon-rfc-does-natwest-rugbyforce-2017 to donate to this worthwhile project. Wimbledon U13s started their season on the back of a mixed 2016 and with a new coach at the helm in club favourite, David Kremer. Unsurprisingly, expectations were tempered but nobody could have predicted what a wonderful season it would turn out to be.